Aceclofenac is a non-steroidalanti-inflammatory drug (NSAID) analog of Diclofenac. It is used for the relief of pain and inflammation in rheumatoid arthritis, osteoarthritis and ankylosing spondylitis. The dose is 100 mg twice daily. It should not be given to people with porphyria or breast-feeding mothers, and is not recommended for children. Mechanism Of Action: Aceclofenac has higher anti-inflammatory action than conventional NSAIDs. It is a cytokine inhibitor. Aceclofenac works by blocking the action of a substance in the body called cyclo-oxygenase. Cyclo-oxygenase is involved in the production of prostaglandins (chemicals in the body) which cause pain, swelling and inflammation. Aceclofenac is the glycolic acid ester of diclofenac. Distribution- Widely distributed in the body as protein-bound form. It is highly protein-bound (>99.7%). Aceclofenac penetrates into the synovial fluid, where the concentrations reach approximately 60% of those in plasma. 15. Elevation of circulating levels of hepatic enzymes. Lithium, digoxin and methotrexate: Aceclofenac may increase plasma concentrations of lithium, digoxin and methotrexate. Anticoagulants: Activity of anticoagulants may be increased. Diuretics : Aceclofenac inhibits the activity of diuretics. When concomitantly administrated with potassium sparing diuretics, serum potassium should be monitored. Cyclosporin: Aceclofenac may enhance cyclosporin nephrotoxicity. Quinolones : Aceclofenac may precipitate convulsions when coadministered with quinolone antibiotics. Acetanilide derivative, Non narcotic Analgesic,Antipyretic. 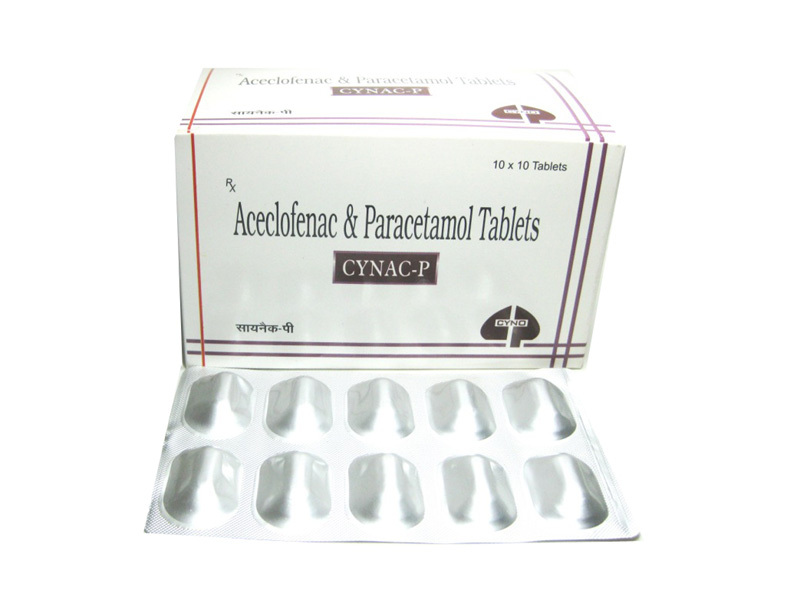 Paracetamol has analgesic and antipyretic action. It is more active on cyclo-oxygenase enzyme in brain. Peripherally it is a poor inhibitor of prostaglandin synthesis. Analgesic action: Paracetamol raises the pain threshold and produces analgesic effect. Antipyretic action: Paracetamol lowers fever by direct action on the thermoregulatory centre in the Hypothalamus and block the effects of endogenous pyrogen. Absorption: Paracetamol is rapidly and completely absorbed after oral administration. Distribution: It is distributed mostly in the body in unbound form. Metabolism: It is extensively metabolised in the liver. Excretion: Excreted in the urine. For migraine: 500 mg to be taken at the first sign of migraine attack and repeated 4 – 6 hourly until suppress mild attacks. 60 mg / kg body weight /day in 4 divided doses.